When they think of getting divorced, many people think of the traditional, attorney-driven divorce; where each side retains a divorce attorney and begin a highly adversarial process of representing “your best interests” in the divorce process.. This is not the only way, however. Unrepresented (that is “pro se“) couples may also get divorced without having attorneys directly involved. 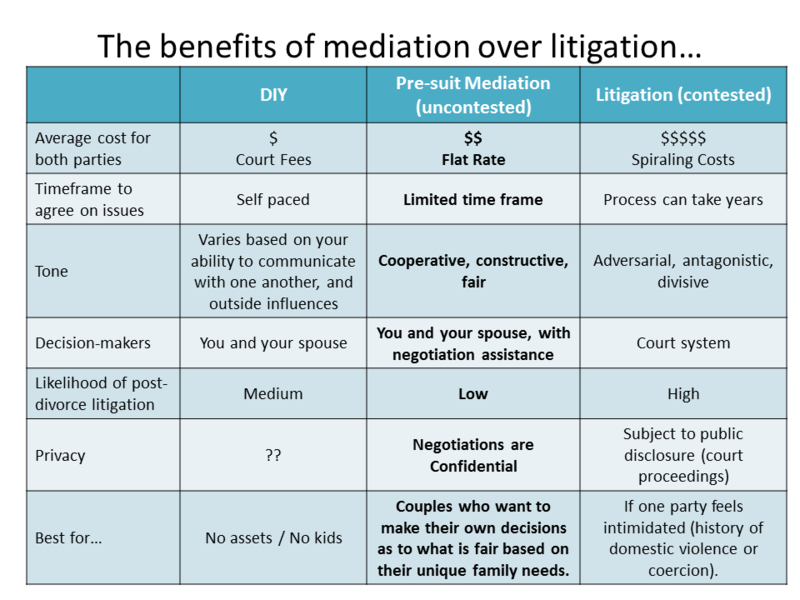 In our unique divorce mediation process, couples work together to determine what decisions will best support their unique family needs moving forward. To get divorced, you have to file a lawsuit in court and a judge has to issue an order that: dissolves the marriage; divides the couples’ marital debts and assets; determines whether any alimony is to be paid (and how much and for how long); and provides for parental timesharing (what used to be called custody of any children of the marriage) and child support (if any). If the two of you have not agreed how to handle the items above, the judge will decide for you. To make all this happen, you and your spouse can hire attorneys to represent your interests in court, in which case you will very likely have your entire divorce process treated like a (quite possibly nasty) civil lawsuit. However, we have found that a legal process that treats your divorce, this major life transition, as if it were “just another lawsuit” inadequately serves many couples.